Carob is the fruit of the carob tree and it is used in the same manner as cocoa powder, it can be sprinkled on food or taken as a tea, extract or in a capsule form. Raw carob is usually perceived as having a bitter flavor which is lessened significantly by the roasting process. For this reason, the roasted product is more popular for food use. Nutritionally, carob is rich in a number of vitamins and minerals but is known to be particularly high in calcium. It is a source of protein and contains a substantial amount of dietary fiber. Carob contains some antioxidants, mostly in the form of polyphenols. It also has an alkalizing effect on body and in certain cultures it is considered to be an aphrodisiac. Throughout history carob has been used as a digestive aid and to soothe an upset stomach. Carob is from the carob tree (Ceratonia siliqua) and is part of the legume family and native to the Mediterranean regions. The trees tend to grow well anywhere where citrus or olive trees can grow but prefer drier climates. It is commonly cultivated in many parts of the world as an ornamental evergreen tree that can grow quite large in size. Carob, the fruit of the carob tree, are slightly curved, thick, dark brown pods that grow anywhere from 4 to 10 inches in length. The developing pods are green in color and turn dark brown when ripen in the late fall season. The seed and pod are usually roasted but can also be consumed raw. Fresh ripe carob pods can be eaten straight from the tree as fresh pods are the best and most nutritious form of carob. There are many cultivars of the carob tree all with slightly varied characteristics. Just like there are different kinds of apples, there are different kinds of carob. In Cyprus, an island in the Mediterranean Sea, they have Honey Carob which produces a soft textured pod and is known to ooze a dark syrup. In California they have the Santa Fe variety which is typically a drier pod, but can still be eaten fresh or further processed to make carob powder. 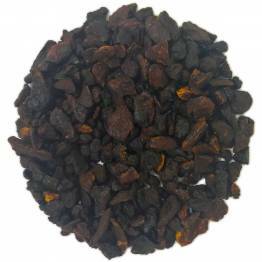 Have you tried Carob Pods C/S, Roasted? Tell us what you think! I’m in love! I’ve always been a fan of carob so I was curious to try this out. I was worried it would be too sweet or perhaps bitter, but it’s very light and easy to drink. I can’t speak to it’s effectiveness in helping with digestive problems just yet, but I will definitely be ordering some more and will update my review if I notice any changes.